in a recent highly publicised event, the un had yet another go at self improvement. Weary eyed observers saw world leaders expound lofty ideas in a series of speeches at a un millennium summit that took place in New York city from September 6-8, 2000. But this time there was a difference, insisted Kofi Annan, the un secretary general. It was a strictly "working summit" heralding the role of the un in the 21st century, both as an instrument of peacekeeping and of sustainable development. Annan, declared that the meeting was meant to harness "the symbolic power of the millennium to the real and urgent needs of people everywhere." A note-worthy concept indeed, but a larger question however remains. Encumbered by a monstrous bureaucracy, saddled with ineffective and languorous bodies, what relevance does the un have in the world today? The traditional peace keeping and human rights affairs still remain its specialities. But the organisation has also been floundering to meet the challenges of an expanding mandate and to define its role in areas other than peacekeeping. 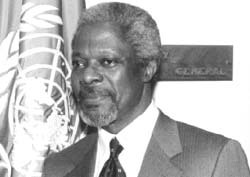 In a millennium report prepared by Annan, which served as the basis for the summit's discussions, he claims that the un' s uniqueness comes from having a mandate that encompasses development, security, human rights, and environment. Among the four areas identified in the report as 'pressing challenges' of the 21st century, the environmental agenda features under a section entitled 'sustaining our future'. That the millennium report has identified environment sustainability as one of the major challenges of the 21st century, is also its recognition to the need for centrally positioning environmental issues in policy-making processes. So far the report admits, this deficiency has been a major stumbling block in achieving sustainable development. The report states that the environment section was aimed to convey with "a particular sense of urgency", the need for environmental sustainability to the summit. The topics it addresses are wide-ranging, from global warming and protection of the ozone layer to global freshwater consumption and biodiversity preservation. The report also correctly points out that "environment issues were never seriously considered in the nearly 18 months during which the General Assembly debated which subjects to include in the summit's agenda. This makes it plain how little priority is accorded to these extraordinary challenges for all humankind." An attestation to this statement lies in the fact that many of the summit's speeches and discussions hardly concentrated on the report's environment agenda. At the end of the three days, world leaders adopted a "United Nations Millennium Declaration", which contains the usual toothless statement of values, principles and objectives for the international agenda for the twenty-first century. On environmental protection, the declaration asks world leaders to works towards the development of forests and sustainable exploitation of water resources, as well as the implementation of conventions on biological diversity and desertification. A specific provision in the declaration is that participants of the summit resolved to make efforts to ensure the effective implementation of the Kyoto Protocol, preferably by the tenth anniversary of the Rio Summit, scheduled to be held in the year 2002. If the un is determined to mainstream 'environment' in its overall agenda in the new century, it needs to move beyond distressed hand-wringing. Perhaps the best place to start work is within its own turf. The environment agenda of the un stands in need of serious consolidation. The institutional framework for global environmental governance lies dispersed, and environmental politicking by convention heads to protect their respective territories abounds. Different convention secretariats, many of them under the un , function as independent bodies, lacking in much needed synergy and coordina tion. unep , the key un institution entrus ted with the environmental agenda, has failed to provide effective leadership. Richer bodies like the World Bank are becoming increasingly involved in 'greener' projects, which has diminished unep 's potential to take charge. If the un plans to live up to the role that it has envisioned for itself in paper, it faces a difficult task. Getting its members to live by it rules is one mean feat.